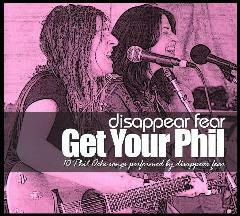 On July 4, 2011, disappear fear will release a new CD of ten songs written by the late Phil Ochs. This CD presents the harmonizing vocals of sisters SONiA (Rutstein) and CiNDY (Rutstein) Frank that have not been featured since the 1996 Seed in the Sahara CD on Philo-Rounder Records. Get Your Phil is 100% made in America Folk Music. Behind the harmonies, most of the instrumentation is played by SONiA on acoustic guitar, piano and harmonica in real time. “We think a new anti-war album released on Independence Day is a great idea and we hope that Phil would be proud ” says CiNDY. SONiA has been a featured performer on many of Sonny Ochs’ (sister of) Phil Tribute Concerts throughout her career. Similarly, disappear fear has recorded two of Ochs’ songs on earlier releases, “Is There Anybody Here” and “No More Songs”. Get Your Phil was engineered and produced by Grammy nominee John Jacob (Maria Muldaur, Bonnie Rait) at his studio in San Jose, California. “I was introduced to Phil’s music when I was in High School, his songs got me through some hard times. I dedicated my first album to him and I aspire to contribute to the world like he did – truthfully,” says SONiA. This entry was posted on June 15, 2011 at 2:44 am and is filed under Uncategorized. You can follow any responses to this entry through the RSS 2.0 feed. You can leave a response, or trackback from your own site.